Alquiler de Bicicletas para el Camino de Santiago | Tournride - Why choose Tournride? When pilgrims decide to start the Way of Saint James on bike with Tournride, there are two decisive arguments to convince them: first, saving money and time while covering more kilometers per day than walking. Second, the conveniences that the bicycle offer us, eliminating -or at least reducing- the hardships of doing the Way on foot, for example: blisters, cramps or inclement weather. All of them more difficult to get around while carrying our backpack. Although all of this hold true, rushed judgments always lead to rushed conclusions, and make us forget fundamental aspects that are brought into the equation. Later we handle them as if they were bad news, though they have been there from the beginning. Therefore, with the purpose of solving all these questions, and show the advantages of the services we offer to any person interested, we explain to you the three advantages that we offer over bringing your own bicycle to the Way. 1. The convenience of choosing Tournride. Let us put ourselves in situation. Everything is ready and planned, the only thing left is to reach the starting point. Our first problem would be to bring the bicycle with us. This means dismantling it, packing it and shipping it (this last step could even include flight transportation of the bike). Do not forget that this process should be repeated when we have reached our destination and suffer the accumulated exhaustion of the journey. Tournride deals with all this process in your stead. You only have to indicate us where you will be staying your first night, and we will make sure that you receive your bicycle there the day before your departure. In the same way, we can collect it when you reach Santiago de Compostela. You only need to identify the bicycle with our contact and booking details, and notify the reception. Even so, we recommend you to bring them to our store to avoid any possible surcharges. That way, you can also meet our staff and tell us about your adventure in our Instagram. 2. A more economical Way. Let us imagine that the journey has been a calm one, and we have arrived to Obradoiro square with that indescribable feeling that only those who have made the Way have experienced. Surprisingly, we are still in one piece, against our predictions. But when we throw a glance at our travel companion, we see that it really shows the harshness of the road. The Way of Saint James is a hard experience for bicycles, and not only in the aesthetic sense. In Tournride we have estimated in 100€ the damage suffered by a bicycle after doing the Way, according to internal data and market pricing. We have to add here the shipping cost of the bicycle, already mentioned. And all this without any mishap who could have left us without any room for maneuver, without assistance or with the impossibility of continuing our journey. All this added to the fact that our bicycles are of mid-upper range and that we assure you a comprehensive assistance during the way -that we will explain in the following point-, means the odds are in our favor. 3. A safer journey, and we give you guarantees: Tournride Full Assistance. 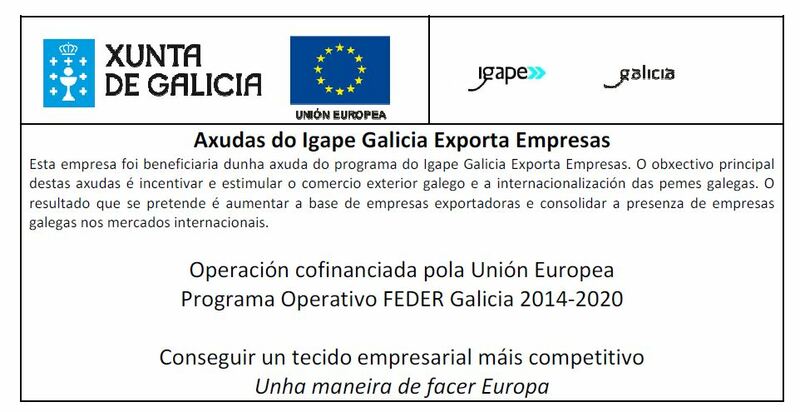 We guarantee you that all our products are suitable to meet the requirements of the Way. Our accessories are tested in long-term routes. The bicycles are subject to a double checking system before being sent, as well as they possesses a self-sealing tubes’ system. 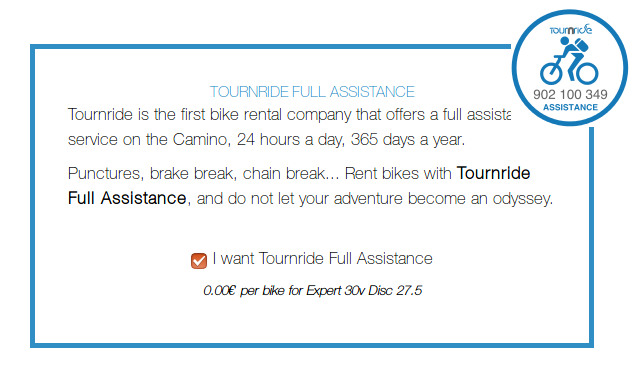 If this were not enough, since the Way can be a hard experience to bicycles -as we have been saying all along- Tournride offers a comprehensive assistance service called Tournride Full Assistance. It consists in a permanent helpline, 24-hour service, 365 days a year, and in 6 different languages. If it happens some incidence that leaves your bicycle immobilized and you are not able to solve it, through this helpline we will provide you a taxi that can take you to the nearest workshop, so the problem can be solved as soon as possible. The repair costs shall be born by Tournride; if the workshop is one of our partners, we will take care of the payment. If this is not the case, you will have to pay for the repairs and we will refund the whole amount with the payment receipt. Its is important at this point to tell apart between two different concepts: repairs and maintenance. The first one, as we have explained, shall be born by Tournride. A proper maintenance, though, is under the responsibility of the client: to keep the moving parts clean and greased. If you don’t know how to do it, we are here to resolve any doubt you may have, and we can recommend you specialized workshops. Lastly, we will show you how to take out Tournride Full Assistance. Once you have selected your route, the bicycle and the accessories, the system will offer you the option of choosing our Full Assistance. It is selected by default for the three models of bicycles available to hire on the Web, and it will not entail any additional cost. But if despite these weighty arguments, we have not managed to convince you and you still want to bring your own bicycle, we can help you to send it back, offering you a box to pack it in Santiago. The box costs 5€, but it cannot be booked since it is subject to availability.